Ok, so it has taken me a while to blog this one! It was an emotional experience though…. Many months and many hundred miles of training later, it was finally time for the big one. I knew it would be a tough challenge and a grueling day to achieve my target but I didn’t anticipate the sporting drama and trauma that was to follow. My race preparation didn’t start well with a 5 hour journey to Stirling by train with faulty air conditioning. My choice was to sit and dehydrate or stay on my feet next to an open window between carriages. However, once I reached Stirling the day improved as I met my good friend and running buddy Lynsey. She made us a lovely high carb meal and I was able to take inspiration from the view of the Wallace Monument! On waking at about 6am, I was quite happy to see an overcast sky and rainfall. I’d been very worried about it being a really hot day and praying for mild conditions all week. As usual on race days I was feeling really nervous. Thankfully, I had Lynsey with me and also running the race. She did as good a job as anyone could have of putting me at ease, and this definitely helped in my preparation for the race. Here we are pictured about half an hour before the race in Edinburgh Waverly station. The race started really well for me. I managed to get away quite quickly and made up the initial time lost getting past the start line in the crowds of runners. I was comfortably clocking up 6.20-6:30 minute miles and continued this form for the first 16 miles. Below this photo is an example of the great support from Ben and Alan. 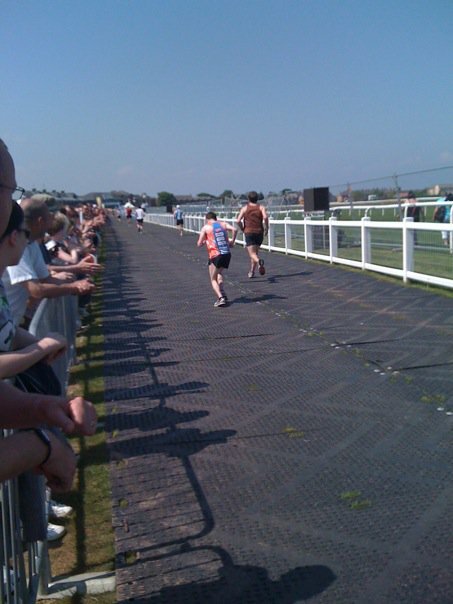 Later I heard a shouts from another group of friends, two of which had run the half marathon in the morning. This was another great boost and I was really in my element. I continued to use the crowds to push me on and the public along the route really were terrific, cheering on everyone single runner as if they were their own. The fun was over though. I’d say I pretty much hit the wall face first after 16 miles. In hindsight this was probably a combination of starting too quickly and the increasingly hot conditions. The heat really did creep up on us. I knew I was lapping gradually slower and slower but at the same time I knew I was still well on target for comfortably under 3 hours. It really is true that it becomes a battle between body and mind. My body was giving up on me. I kept arguing with myself about whether I could make it to the finish or not. Nothing I did in training would prepare me for the final 2 miles. My feet were on fire. As a fellow runner commented the next day, it was like running through a blast furnace! My legs started turning to jelly and they were travelling more slowly and slowly with every few yards. Looking at my watch I still knew I had around 12 whole minutes to finish the race under 3 hours! And considering I had been completing the first 16 miles of the race in about 6:20/6:30 each it seemed a certainty. 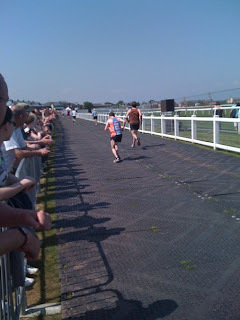 Then finally I could actually see the finish line! The noise was unbelievable as the final straight was lined with spectators willing us all on. At this point my legs were jelly though and it was a real struggle to move one foot in front of another. I was on the final straight though so adrenaline would take me through. Until out of no where my legs just gave way completely and I fell to the ground like a sack of tatties. It’s really difficult to describe this feeling as it’s not something I’ve ever experienced before. I hadn’t given up – but my body had. It wasn’t just a fall, it was my body being completely sapped of energy and shutting down. I got on all fours, and made a half hearted attempt to get up again. I remember just being overwhelmed by this and wondering what on earth to do. I can’t really remember this but my friends Bruce and Lyle who happened to have a great view of the whole incident tell me that I managed to get up briefly but then hit the deck again and couldn’t get on my feet. Apparently Lyle was almost over the fence at this point to help me up. 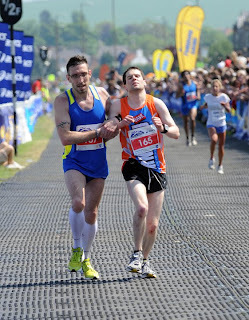 Then out of nowhere, a fellow runner (later named Darren Tanner from Nottingham) hauled me up from the ground and got me going on what seemed like the longest journey ever to the finish line. In fact at one point I stopped because for some reason I thought we’d crossed the line, but my helper told me otherwise and we got going again. I remember Bryan Burnett, who was commentating on runners crossing the line remarking on what a great story it was that “2 pals had helped each other across the line”. But what made the story even more amazing, that we weren’t pals but complete strangers. And the arrangement was very one-sided! I had made it though. I made an attempt to thank Darren with a wee pat on the head. It really was a terrific act of sportsmanship and one that will not be forgotten. I would never have made it across the line otherwise, I was completely spent. The race didn’t end there for me though. I couldn’t stay on my feet after the finish line and a member of the medical team asked me if I needed any help. I remember telling him I was about to collapse. So before even having time to thank the man who had helped me across the line, I was helped into the medical tent where I was laid down. At this point I urinated myself, apparently losing control of all bodily functions! I did let the nurse know as I was doing it but she said something along the lines of that being the least of my problems. My temperature was taken which was apparently at 39.7 so pretty high. Their aim was just to cool me down. I can only describe it was feeling drunk and I remember even giving a bit of cheek to the nurses, just as I probably would have had I had a few pints. I was also crying spontaneously for no reason. After a good while trying to cool me down they tried to get me on my feet again but then cramp struck in both legs. Eventually I was transported to the cool down tent where people in a less serious condition stayed. Then an emotional reunion with my friends who had been there to support me and Lynsey. Special thanks to Bruce who spent the rest of the day and night cracking jokes about me not finishing the marathon and also doing distasteful impressions of me collapsing on the home straight. We celebrated suitably with a single a malt. Lynsey described the feeling the next day as being like hit by a train, and I think that was pretty accurate. I felt quite sick and just weak in general, which I guess is to be expected! There was another surreal moment to come though. A couple of my friends texted me to let me know there was a wee photo of me in the Scotsman. So Leanne and I went down to the shops and picked up a couple of them. Then Lynsey said there was a bigger picture in the Edinburgh Evening News which had a souvenir pullout. So we went down to a newsagents in Edinburgh to get a couple of them as well. 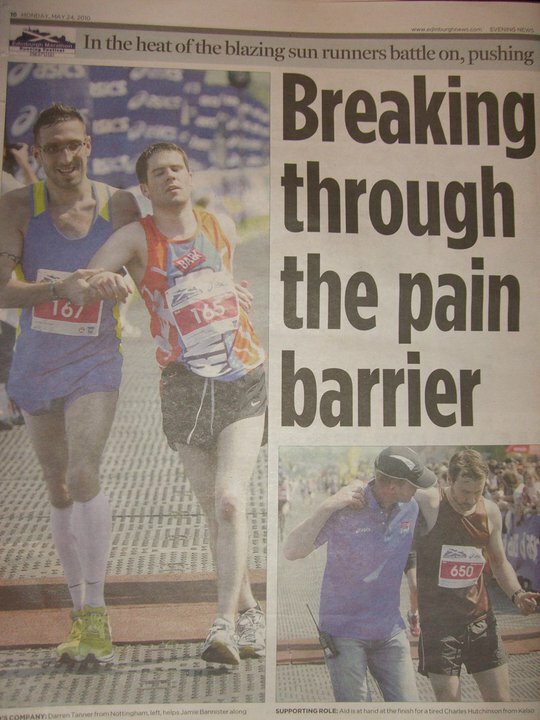 But then out of curiosity we started opening up some of the other papers, and paper after paper seemed to have picked out the photo of me being helped across the line. It seeemed that the press has picked it as the iconic image of the marathon! 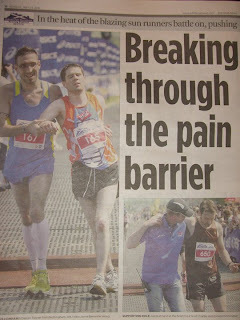 The Daily Mail even managed to make it look like my marathon attempt had been fatal as you can see from the clipping below. It was quite an experience. An experience that I don’t feel I recovered from until the following Thursday. 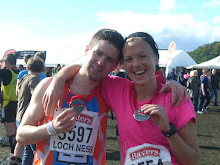 Onwards to the Loch Ness Marathon, 3rd October!